Tax reform is now in the Senate’s hands. Republicans only have two votes to spare in the Senate, where they hold a 52-to-48 edge. Vice President Mike Pence would break the tie, if needed. However, multiple Republicans remain uncommitted to the bill, citing concerns with tax breaks for businesses or a potential increase in the federal deficit. As it stands now, the Senate’s tax overhaul plan is slightly different from that of the House’s version. The two chambers would need to come together on a unified piece of legislation to advance to President Trump’s desk. Here’s a look at what the Senate’s tax plan would do. The Senate’s tax plan would eliminate state and local tax deductions – meaning taxpayers in high-tax states would lose a write-off. This would impact mostly blue states, such as California and New York. This is one area where the House and Senate plans have diverged, especially as many House lawmakers – including Republicans – opposed the provision. The House’s measure leaves in place property tax deductions up to $10,000. Sen. Susan Collins, R-Maine, is also concerned about the impact the elimination of these deductions would have on taxpayers. She reportedly met with Trump to discuss a compromise in the final legislation, such as the one provided in the House measure. She said it was a “fair assumption” that she was more likely to support the tax reform measure with the inclusion of the property tax deduction. Provisions for “pass-through” businesses is shaping up to be one of the greater fights among lawmakers in the tax reform debate. A pass-through business refers to one that is not a corporation, and therefore isn’t taxed as such. These include sole proprietorships, joint ventures, limited liability companies and S corporations. Millions of American businesses use the pass-through taxation format, where the profits are counted in the owners’ personal tax returns. The Senate measure would set a new deduction of 17.4 percent for those who qualify for the pass-through taxation. It also makes it easier for taxpayers to obtain this deduction. However, it includes a clause that would sunset this deduction after 2025. On the other hand, the House plan would reduce the tax from 39.6 percent to 25 percent. At odds here is which plan provides a greater savings for a greater number of pass-through businesses. As Politico noted, under the Senate’s version, not everyone would be able to take advantage of the full 17.4 deduction offered. If half of a taxpayer’s wages is lower than 17.4 percent, that is the applicable deduction. Sen. Ron Johnson, R-Wis., voted to move the legislation out of the Budget Committee Tuesday, but he told Fox News he still has reservations about pass-through deductions. Johnson added that Trump said the pass-through issue was “important” and promised to “fix” it. Like Johnson, Sen. Steve Daines of Montana hasn’t put his support behind the Senate’s plan over concerns about pass-through businesses. The Senate’s tax plan includes a repeal of the individual mandate, the ObamaCare requirement for Americans to have health care. Sen. Susan Collins, R-Maine, broke with her party and voted against a skinny repeal of the Obama-era health care earlier this year, but she might be open to passing tax reform with this provision if certain amendments are included. After meeting with Trump Tuesday, Collins said she’d also won agreement that before completing the tax measure, Congress would approve legislation restoring federal payments to health insurers that Trump scuttled last month. The Congressional Budget Office predicted that repealing the mandate could reduce federal deficits by about $338 billion over the next 10 years. It would also increase the number of insured Americans by about 13 million people in that same time span. When it comes to reducing the corporate tax rate, the House and the Senate agree. Both chambers want to see the tax rate lowered to 20 percent from 35 percent. However, the Senate measure would delay the implementation for one year. The Senate measure would drastically hike the current per-child tax credit to $2,000 from $1,000. Some Republican senators, including Marco Rubio of Florida and Mike Lee of Utah, have advocated for increasing the deduction. Earlier in November, Rubio criticized the House plan for not raising the credit enough. The House plan would only raise it by $600. The progressive Center on Budget and Policy Priorities has criticized the Senate proposal for not helping enough low-income families despite raising the credit. Writers for the think tank argued that many families would be unable to receive the full benefits. Ivanka Trump, the presidential daughter and adviser, has been largely involved in working with lawmakers on boosting the child tax credit. 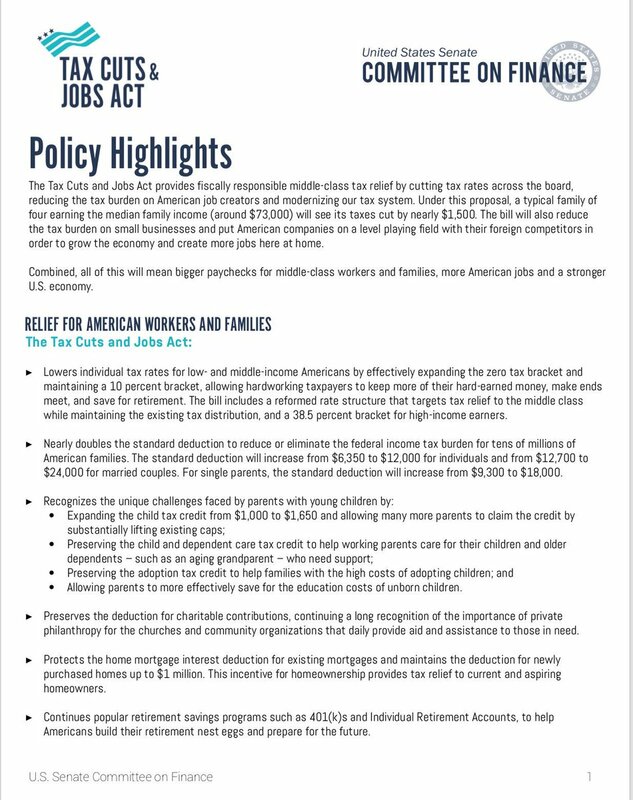 With the Senate bill, the standard deduction – the amount which reduces the amount of income Americans are taxed – would increase to $12,000 for individual filers and $24,000 for married couples. Tax experts also predict that this provision would drastically decrease the number of taxpayers who would file itemized deductions as some would see a greater savings with this plan. The House plan, on the other hand, would drastically reduce the cap on the popular deduction to mortgage interest to $500,000. The alternative minimum tax would disappear under both the House and Senate’s plans. The tax is meant to offset benefits a person with a high income could receive. It also ensures taxpayers pay a minimum of tax, according to the Internal Revenue Service. About 5 million households a year are targeted with the alternative minimum tax, NPR reported. Over the years, it has not been adjusted for inflation and has hit more households than originally intended, tax experts have said. Republicans hope to phase out the so-called estate tax – sometimes referred to as the “death tax” by opponents – with their tax overhaul. The federal estate tax is a tax on the transfer of property after someone’s death. That property must exceed a certain value amount for the tax to be applicable. Only the wealthiest 0.2 percent of estates owed any estate tax at last count, according to IRS data and the Center on Budget and Policy Priorities. The Senate’s plan does not eliminate the tax, but it would double the exemption. On the other hand, the House version would double the exemption to $11 million for individuals and $22 million for couples, but would repeal the entire tax after 2023. While the House plan would eliminate the medical expense deductions, the Senate measure would leave it in place. Under the current system, taxpayers are able to deduct medical expenses that exceed 10 percent of a person’s adjusted gross income. That percentage is lowered to 7.5 percent for taxpayers who are over 65 years old. AARP, the seniors’ lobbying group, has urged Congress to keep the deduction in place. The Senate proposal keeps the current number of personal income tax brackets, seven, though it changes the rates to 10, 12, 22, 24, 32, 35 and 38.5 percent. That last top bracket for the wealthiest earners carries a higher rate of 39.6 percent under current law.